Bobby Alu has released a new single this month and has dates lined for a tour starting late March and going in to May. Winter Tour '05-'06 is a live album by the band Slightly Stoopid that was released in 2006. A live DVD recorded in San Diego, CA on November 26 and 25, 2005 was also released to coincide with the album. Perform at Lollapalooza 2010, Mile High Music Festival and More! San Diego-based dub/rock/psychedelic-jam phenoms SLIGHTLY STOOPID have just announce a massive headlining US tour accompanied by legendary hip-hop group Cypress Hill. The tour, named Cauzin Vapors... Legalize It, and riding behind the political undertones of "legalizing it," will kick off in mid-July and see both bands traveling from California to New York, along the entire eastern coastline, and across the country, with stops at this year's acclaimed Lollapalooza festival in Chicago and the Mile High Music Festival in Colorado. Prior to their July dates, SLIGHTLY STOOPID will start their Summer festivities by traversing the entire West Coast with the mighty Steel Pulse and friends and label-mates The Expendables, in addition to more Summer festival performances to be announced. Slightly Stoopid has recently logged some serious road miles as part of their annual Summer Ampitheater Tours. Past creative touring partners and lineups include Snoop Dogg, The Marley's, G Love & Special Sauce, Ozomatli, Sly & Robbie and Pepper. They have also shared the stage with Dave Matthews Band, Damian “Jr. Gong” Marley, The Roots, Toots and the Maytals, Bad Religion, among others over the course of their career. In addition to their incessant criss-crossing of the U.S., which also includes previous appearances at other prestigious festivals such as Coachella, Austin City Limits, and New Orleans Jazz Fest, the group has played sold-out shows in Australia, Japan, Guam, Amsterdam, Portugal and Denmark, the U.K., Germany, Holland, and the Dominican Republic. “Without [the fans], we’d just be playing at the bar,” admits Kyle. “They make it worth our while – when we go out and people are having that good of a time, the energy goes back and forth. Just a good time – we rely on each other’s energy.” And all you have to do is look at the list of artists that Slightly Stoopid has played with, to get a feel for how much of a large and diverse audience they appeal to. 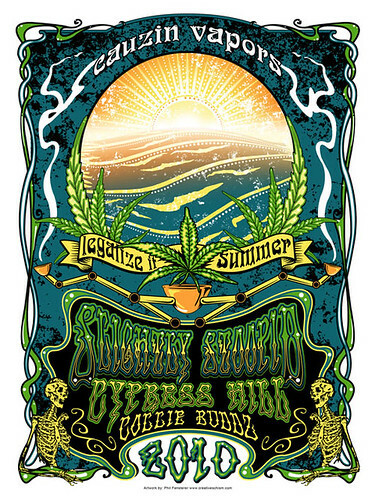 The Slightly Stoopid story can be traced to Ocean Beach, California, when childhood chums Miles and Kyle formed the group in 1995, mixing reggae and punk sounds into one smooth stylistic cocktail. Soon after, late/great Sublime frontman Brad Nowell caught wind of the group, and signed them to his Skunk Records label – while the band members were still in high school. A pair of releases soon followed for Skunk - 1996's punk-tinged SLIGHTLY STOOPID (featuring a guest appearance by Nowell on the song “Prophet” – later covered by Sublime and released on their box set, EVERYTHING UNDER THE SUN) and 1998's surf-inspired cult classic THE LONGEST BARREL RIDE. Most recently, the band has continued their mainstream successes, seeing their last two albums, 2007's CHRONCHITIS, (which featured guest appearances by Guru of Gang Starr, Angelo Moore of Fishbone, Money Mark of the Beastie Boys and G. Love) and 2008's SLIGHTLY NOT STONED ENOUGH TO EAT BREAKFAST YET STOOPID, charting in the Billboard Top 100, with both albums appearing on the band's own Stoopid Records. To date, the band has sold over 750,000 records on their own label, has performed on Jimmy Kimmel Live, and has had their songs appear on hit television series' Scrubs, The O.C., Cribs, and more. Slightly Stoopid has also consistently been selling out venues and ampitheaters across the country for the past 3+ years and consistently appear on Pollstar's top grossing tours. I listened to many styles of music growing up. I have gone to many shows starting from a very young age. In fact, there is not a week that goes by that I do not go to at least one show. I will not pass up an opportunity to see a good band, even if that means I go alone. I prefer the shows that are not too crowded where I actually have an opportunity to talk to the band and tell them how much they have inspired me. I have one agenda with Musicbailout.net and that is to provide the most up to date and recent news to the fans of Reggae Rock. It is my desire to assist bands in promoting their music with no hassle. I enjoy giving the most underground band the attention they deserve and to be heard not only in their city but across the world. I strive for all bands in this genre to get the news they need to provide to the fans ASAP, things such as CD releases, tour dates, pictures, video, and much more. Musicbailout.net is nothing more than a guide for fans. For fans of Reggae Rock, Surf Rock, Dub, Hawaiian, and more. To hear amazing music from bands that pour their hearts into it and tour the country for you. Musicbailout.net is a way to hear more of the music you love but may not have found yet. Musicbailout.net will lead and direct you through this great genre of music. This is the music I am inspired by, I am passionate about, and will do whatever it takes to spread the good vibes this music brings to me.